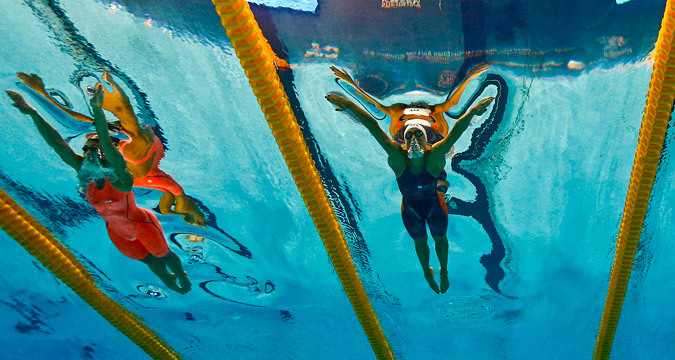 The Aquatics World Championships in Kazan, Aug. 7, 2015. From scandals and international bans to changes of citizenship and the arrival of a new generation of top figure skaters, 2015 was not short on drama in the world of Russian sports, though many pundits might have welcomed a quieter year. Here are eight of the key events and trends that defined 2015 for the Russian sports fan. While earlier it was only Moscow and St. Petersburg that could boast top-level sporting events, the 2014 Winter Olympics in Sochi kick-started a trend of sporting events being hosted in the Russian regions. The biggest event of 2015 was the World Aquatics Championships in Kazan. Though the world judo and taekwondo championships in Chelyabinsk, the Bandy World Championships in Khabarovsk and the ISAF Nations Cup Grand Final in Vladivostok were not far behind. At the beginning of 2016, another Russian regional sports center will come to the fore; the town of Kolomna near Moscow will host the Speed Skating World Championships. After naturalized athletes – short track speed skating athlete Viktor Ahn and snowboarder Vic Wild – won as many as five top-notch medals for Russia at the Winter Olympics in Sochi in 2014, speculation about recruiting foreigners for the national team broke out with renewed vigor. Leonid Slutsky, the new head coach of the Russian soccer team, has not ruled out this possibility, though Russia is continuing to rely on its own players for now; the much talked-about transfers are stirring up boxing and mixed martial arts. In 2015, two Americans became Russian citizens – boxer Roy Jones and mixed martial arts fighter Jeff Monson. In both cases, an important role was played by the political factor: Both publicly admitted being sympathetic to the country's leadership. Women's figure skating has always been the Achilles heel of the Russian team. The 1970s and the 1980s were dominated by Soviet sports pairs and dance duets, while in the 1990s and the 2000s, it was Russian male single skaters who were in a league of their own.